The busy season at Zion National Park, one of Utah’s iconic "Mighty 5" national parks, is full of visitors. Mostly from March through October, more than 4.5 million tourists made the trek to Zion in 2017 alone and the park anticipates continued growth. Over the past decade, there’s been a 70 percent jump in annual visitation, leading the Park Service to consider proposals to protect Zion’s sensitive natural environments while continuing to provide quality visitor experiences. While the park mulls over ways to manage high visitation during the peak season, the simplest way to avoid the masses and enjoy Zion is to come in the off-season, which runs from December through February. During those months, you’ll avoid traffic jams at the entrance stations, crammed parking lots, streams of hikers on popular trails, and overbooked hotels and restaurants in Springdale, which sits on the southwestern edge of the park. 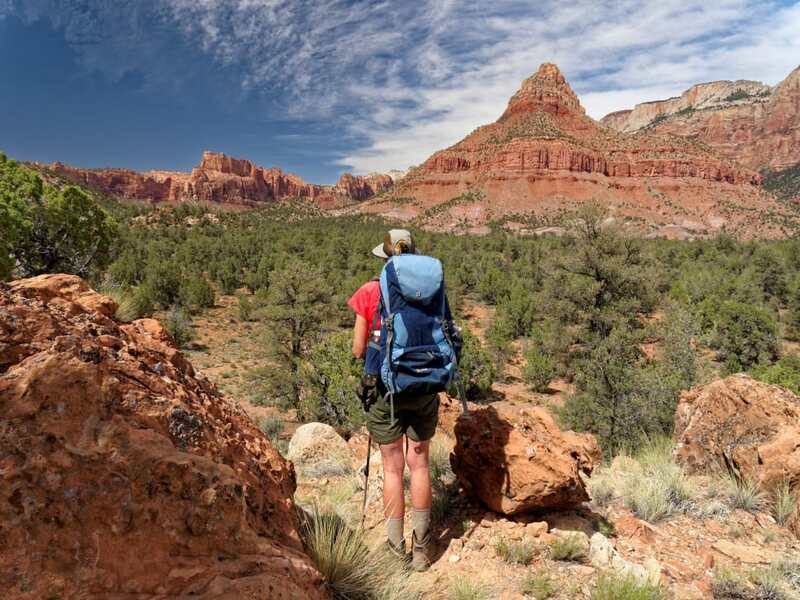 Instead, you’ll find a quiet Zion where you can still drive into majestic Zion Canyon, hike the Narrows with far less company, watch deer graze in meadows below the Great White Throne, and go mountain biking, hiking, and canyoneering outside the national park. As a bonus, you’ll save cash with affordable lodging and your pick of fine restaurants in Springdale. Need a few more reasons to come in the off-season? The park’s off-season weather is a big surprise to visitors, with generally mild winter days. While you see spectacular photos of Zion’s cliffs draped in glistening snow, the fact is that it rarely snows at the lower elevations in Zion Canyon and Springdale, which lies at a modest 3,900 feet. Daytime high temperatures are often in the 50s and 60s, sometimes climbing into the 70s, while nighttime lows dip into the 30s, making perfect weather for driving the scenic roads and hiking Zion’s trails. If that seems a bit too cool, remember that summer not only brings crowds of tourists but also temperatures soaring into the low 100s. The off-season is the ideal time to hike Zion’s trails as you’ll find fewer people and plenty of parking at trailheads. Even the popular hikes in Zion Canyon like Lower Emerald Pool Trail, Weeping Rock Trail, and Riverside Walk are uncrowded. You’ll see few other hikers on longer trails like Angels Landing, one of the summer’s most popular hikes, and the Observation Point Trail. The lower elevation trails are usually dry on sunny sections with icy patches lingering in the shade, while the high-elevation trails are icy and snow-covered. A good winter hike for snowshoers is the East Rim Trail to the overlook at Cable Mountain. Check in at the visitor center for current trail conditions and bring microspikes for traction and trekking poles for balance if it’s icy. Zion’s off-season brings not only fewer visitors but also less traffic. The waits are short at the park entrance stations, and you’ll have no traffic jams and plenty of parking spaces along roads. The best part of the off-season is that shuttles don’t run up the 6.5-mile Zion Canyon Scenic Drive, so you can experience the park’s most spectacular scenic road from the comfort of your own vehicle. The drive, following the canyon floor alongside the Virgin River, offers gorgeous views of towering sandstone formations and allows quick access to canyon trails. Be sure to stop at designated viewpoints like Court of the Patriarchs, Big Bend, and Temple of Sinawava for postcard views and trailheads for Angels Landing, Emerald Pools, and Sand Bench trails. Afterward, take a drive up the Zion-Mt. Carmel Tunnel and hike the short Canyon Overlook Trail for views into Zion Canyon. Springdale makes the best base camp for exploring Zion in the off-season. Without crowds of tourists, accommodations are plentiful and less costly than the busier months. You can pull in and get a room without a reservation at most hotels and motels in town (although calling ahead is recommended, particularly on holidays, to reserve your accommodations). You also can stay at Zion National Park Lodge in the heart of the canyon, with its spectacular views and quiet ambiance. If you want to rough it, Zion’s Watchman Campground is open on a first-come, first-served basis in the off-season. Campsites are usually available except on busy weekends. After you’ve explored Zion Canyon and hiked a few park trails, head back to Springdale and discover plenty of outdoor adventures outside the national park. The off-season months are ideal for riding mountain bike tracks with cooler temperatures, few riders, and mostly dry trails. West of town is Gooseberry Mesa, offering some of Utah’s best singletrack terrain, and Guacamole Mesa’s 14 miles of slickrock trails, which are surrounded by breathtaking scenery. For an easy ride, follow an old road to the ghost town of Grafton. While off-season is too cold for extreme canyoneering, stop by one of Springdale’s outfitters like Zion Guru or Zion Outfitter and see what dry canyons are open for adventure. They also can guide you rock climbing on sunny sandstone cliffs. 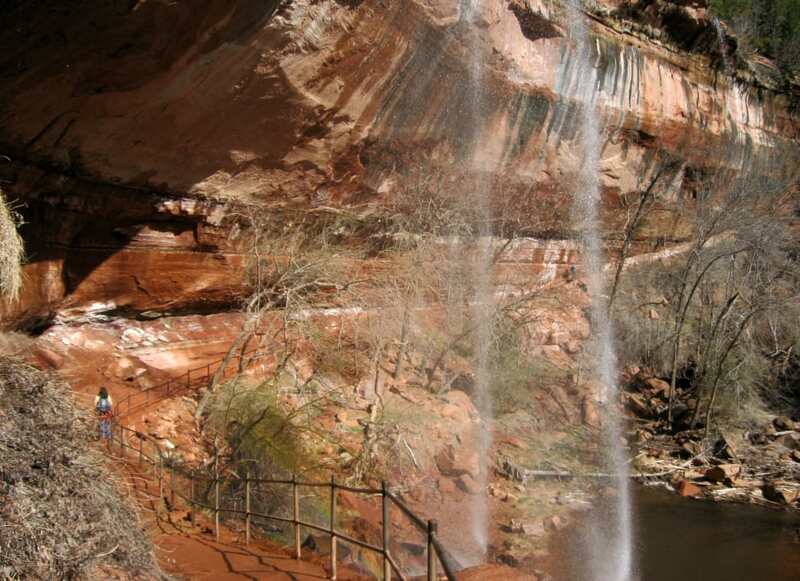 Springdale is a big draw for hikers, too, with miles of scenic trails outside Zion. Recommended hikes close to Springdale include the Eagle Crags Trail, Anasazi Trail, Coalpits Wash Trail, and Chinle Trail. 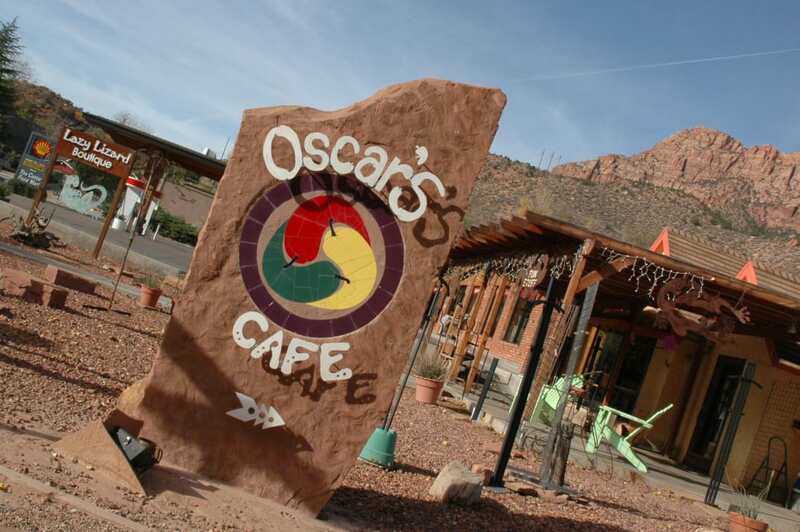 After hiking Zion’s trails and taking in the astounding scenery, head back to Springdale for après hike drinks and fine meals. The town offers a variety of dining options for every taste and wallet, most within walking distance of your hotel, and far fewer visitors in the off-season. It’s a great opportunity get to know the locals and learn more about what you can do in (and out of) the park. Zion Park Boulevard, the town’s main street, is lined with art galleries, shops, and restaurants serving Mexican, Asian, vegan, pizza, and American cuisine. Local favorites include Barefoot Taqueria, Bit & Spur Restaurant, Spotted Dog Café, Oscar’s Café, Cafe Soleil, Bistro H, and Jacks. For the best pint of handcrafted locally brewed beer and pub food, visit the Zion Canyon Brew Pub at the national park entrance. Written by Stewart Green for Knockaround in partnership with ZionNationalPark.com.